All Access allows you to read The Press of Atlantic City any way you want: in print or on your computer, phone or tablet. 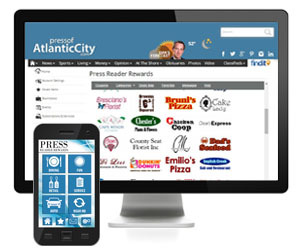 All Access includes immediate and unlimited access to PressofAtlanticCity.com, the mobile version of the web site (optimized for smart phones), The Press of Atlantic City News App, and an electronic replica ePaper. Additionally, depending on which service type you choose, you'll receive At The Shore, The Current or Gazette and Flavor magazine. Current home delivery subscribers, activate your digital account here! Get 7 Day home delivery for the same price as Thursday-Sunday! Limited Time, Act Now! * Introductory offer for 3 months at $3.95 per month. We reserve the right to increase prices accordingly after the introductory offer. IMPORTANT: Offers available to new accounts or accounts who have been inactive for at least 30 days ONLY. 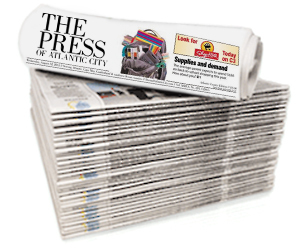 The Press of Atlantic City has included a number of value-added publications to help pay for production of a 7-day newspaper that’s delivered 365 days a year. All print subscribers will receive our Thanksgiving Day paper, the largest paper of the year, for a charge of $3. This rate includes the $1.25 per issue for Flavor Magazine. These additional charges will result in a slightly earlier renewal date. If you do not wish to receive the Thanksgiving paper or Flavor Magazine, please contact us at (609) 272-1010 choose option 1. Service fees: There is a $5 processing fee for refunds remitted to the customer. A $30 fee will be charged to your account for any returned check. Expiration date: Your expiration date is based on current pricing and is subject to change with any future price adjustments. Payment frequencies: We offer payment frequencies such as monthly EZ Pay, as well as 13, 26, and 52 weeks. Call (609) 272-1010 choose option 1 if you would like to change to a different frequency. The Press of Atlantic City has included a number of value-added publications to help pay for production of a 7-day newspaper that’s delivered 365 days a year. All print subscribers will receive our Thanksgiving Day paper, the largest paper of the year, for a charge of $3. This additional charges will result in a slightly earlier renewal date. If you do not wish to receive the Thanksgiving paper please contact us at (609) 272-1010 choose option 1. Service fees: There is a $5 processing fee for refunds remitted to the customer. A $30 fee will be charged to your account for any returned check. You will also be charged applicable sales tax based on the laws of the state of your mailing address. Payment frequencies: We offer payment frequencies such as monthly EZ Pay, as well as 52 weeks. Call (609) 272-1010 choose option 1 if you would like to change to a different frequency. 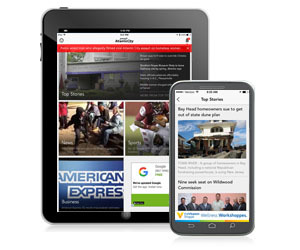 You'll not only receive home delivery of Augusta's largest daily newspaper, you'll also get free access to all of our digital products: AugustaChronicle.com, The Augusta Chronicle for iPad and Smartphones (iPhone and Android), The Augusta Chronicle Print Replica (PC). Press Reader Rewards is a program designed to say “thank you” to our loyal subscribers. Press Reader Rewards members are eligible for discounts at 100 locations, including restaurants, entertainment venues, services, and more. Log in online and view the great deals currently available OR download our app from Google’s Play Store, the iTunes App store, or Amazon.com’s Marketplace. Choose from one of four home delivery options for The Press of Atlantic City that may include At The Shore*, The Current or The Gazette Newspaper**, advertising inserts, coupons, and special sections and magazines such as Flavor, Wellness, and the Summer Fun Guide. 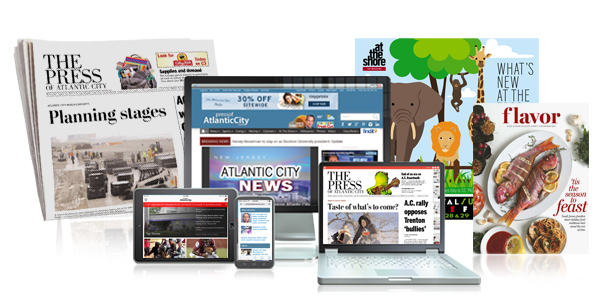 Every subscription provides unlimited access to The Press of Atlantic City’s website giving the reader the most trusted and comprehensive up-to-date news coverage in Southern New Jersey. View daily video weather reports from Dan Skeldon, enter contests to win great prizes, preview and catch up with professional and local sports, and so much more. PressofAtlanticCity.com is easily accessible on any smartphone. The mobile version is user friendly and provides the same thought-provoking content as the print and desktop version. Access what you want, when you want it, where ever you are. 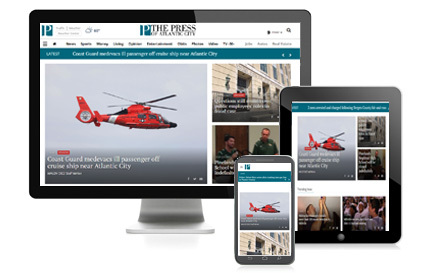 All Access includes unlimited access to The Press of Atlantic City News App. Download the app on your mobile device. 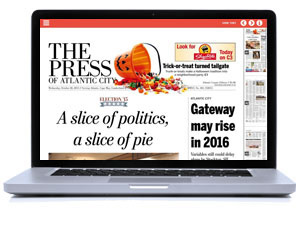 Welcome to the digital replica of the print version of The Press of Atlantic City. Flip through articles for the past weeks newspapers in a convenient, sleek, edition of the printed product. From Grandma’s homemade meatballs to the best place for fresh seafood, food is a crucial part of life at the shore. In celebration of all things culinary, The Press has launched a new monthly magazine called Flavor: Food & Drink in South Jersey. 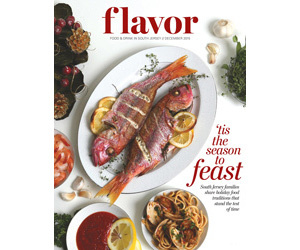 Flavor is a locally-focused food magazine delivered directly to Press subscribers. Filled with high-quality, magazine-style photos and layout, thorough reporting and snappy writing, Flavor offers readers an appetizing array of food and dining information. The area's definitive guide to all things South Jersey. 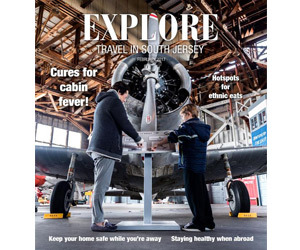 EXPLORE will showcase a diverse range of local topics that help readers make the most of their lives. This quarterly magazine reflects the true character of our communities.